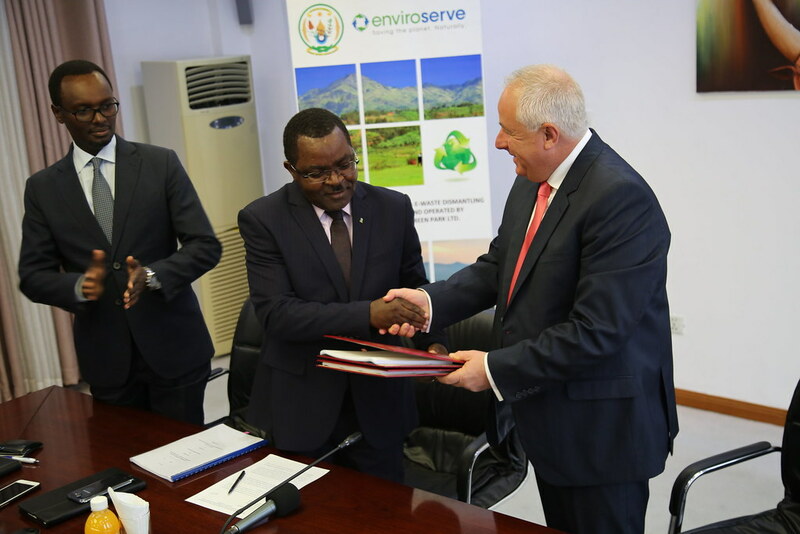 The Ministry of Trade and Industry has signed a 10 year lease agreement with Enviroserve Rwanda Green Park (a subsidiary of Enviroserve Services LLC Dubai) to operate and expand the Rwanda E-Waste Dismantling and Recycling Facility. The facility was constructed by the Ministry of Trade and Industry through a Rwanda Green Fund (FONERWA) investment of more US $1.5 million. Develop e-waste collection points/centres around the country to ensure the proper collection and treatment of electrical and electronic waste. Expand the e-waste facility by introducing new machinery and equipment such as refrigerant gas recycling machinery, data destruction machinery, and others. Pay the Government of Rwanda a lease fee over the 10-year period. Conduct regular public awareness about the proper management of e-waste and its impact on human health and the environment. After the signing, Minister Munyeshyaka spoke about the importance of the agreement for e-waste management in Rwanda. “This is a unique moment as we sign a lease agreement between the Government of Rwanda and Enviroserve, a private investor that will manage the e-waste dismantling and recycling facility. The deal is worth US $2.6 million, an amount that surpasses the initial investment of US $1.5 million from the Rwanda Green Fund,” said Minister Munyeshaka. He also noted that the partnership will boost e-waste management capacity and support industrial symbiosis across the country. “During the ten year lease period, the high tech facility will be run by an expert investor who will ultimately transfer skills to local staff to manage and operate the facility in addition to providing the raw material to other industries, such as steel industries. All of this is in line with the newly adopted National Strategy for Transformation and Rwanda’s resolve to build a green economy,” the Minister said. Mr Fleming also thanked everyone who played a part in establishing the facility. Under the new agreement, the e-waste sector in Rwanda will expand by encouraging businesses and citizens to deposit e-waste at soon to be established collection points countrywide. At the signing ceremony, Enviroserve announced that the company will seek to import e-waste from neighbouring countries so that Rwanda can become Africa's hub for e-waste recycling. The lease fee paid to the Government of Rwanda will be reinvested in environmental and green growth initiatives through the Rwanda Green Fund (FONERWA). Learn more about the fund’s investment in e-waste management in Rwanda here.